One of the things I loved about staying in Madrid (besides the tapas) is its central location, making the Spanish capital a convenient jumping off point for daytrips. Thanks to the high-speed AVE train, there are a handful of cities that can be reached in less than 2 hours – Toledo (30 minutes), Ávila (1.5 hours), Valencia (1.75 hours), Cordoba (1.75 hours, and about 45 minutes more to Sevilla) and one that’s a little more off people’s radar, Segovia (30 minutes from Madrid’s northern Chamartin station, not to be confused with the main Atocha station). Like much of the Mediterranean region Segovia was once part of the Roman Empire before it was reclaimed by the Spanish crown, and traces of its layered past have been thoughtfully preserved (and in some cases rebuilt) for tourists today. 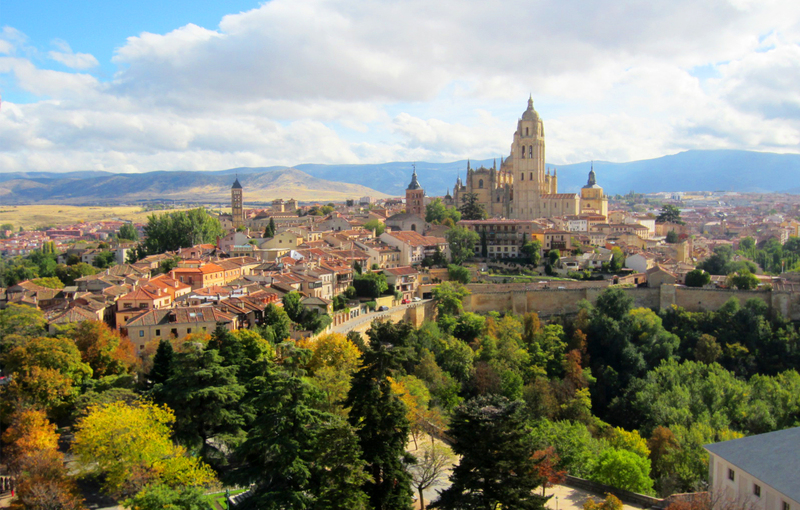 It’s hard to describe the city in one word as some of Segovia’s most distinctive sites are larger-than-life, while other spots hint at a laid-back European charm. 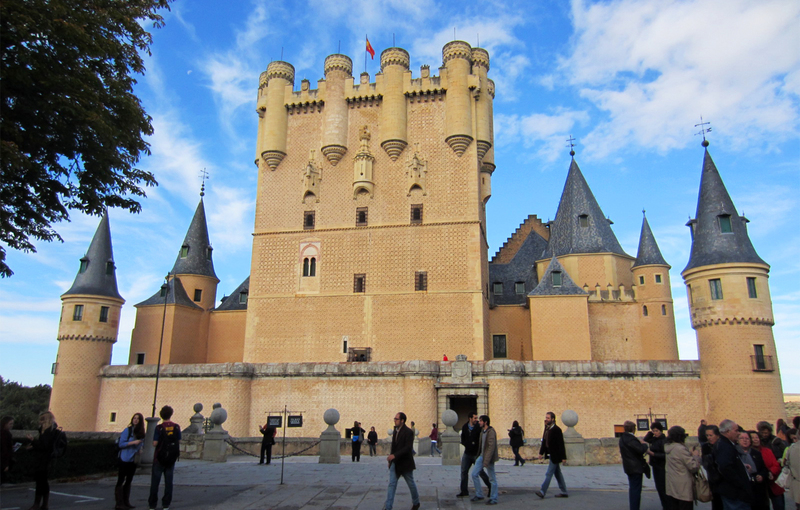 And considering how close it is to Madrid, Segovia feels a world away. Here’s a snapshot of our visit. Segovia’s Guiomar AVE train station is located outside of the historic center, so from here we took bus #11 to the base of the town. 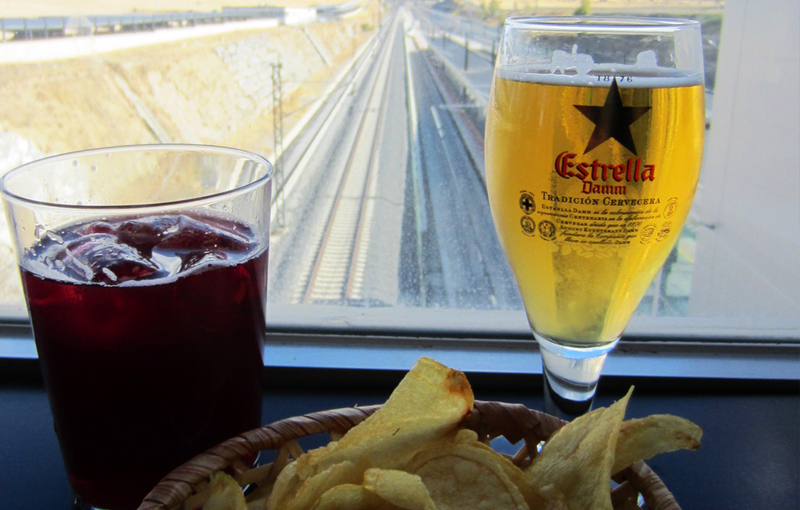 (Note that slower cercanías trains arrive at a separate station that’s within walking distance of town, so be sure to check your ticket to know where you’ll be arriving.) 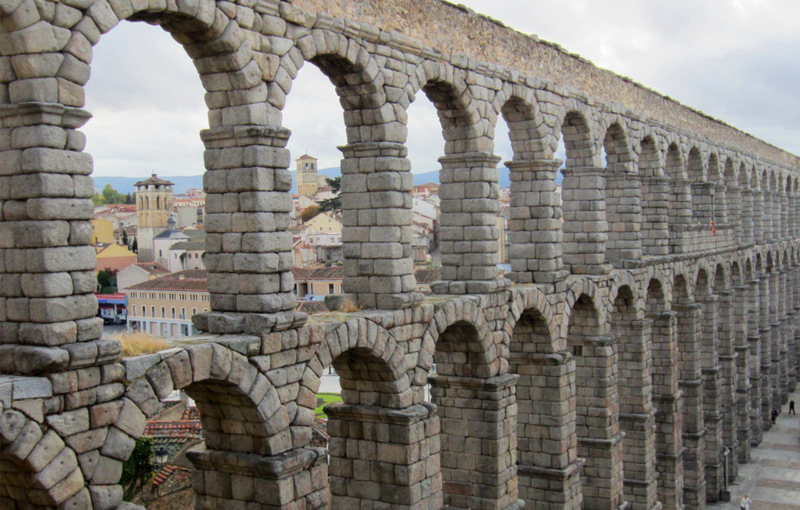 At first it felt like we were in the middle of the countryside – an empty open space sans a few grazing cows – but after about 20 minutes on the bus we were greeted by one of Segovia’s most striking sites, the nearly 100-foot tall Roman Aqueduct. Standing guard at the “front door” of this medieval walled city, the aqueduct was built around 50 A.D. under Emperor Trajan as part of a complex 9-mile system. The exposed portion you see here stretches almost half a mile long and can still carry water. Long live Roman grandeur, right? Just inside of the aqueduct on the right is the tourist information center on Plaza del Agoguejo where you can pick up a map or use the W.C. before heading out. Behind here you’ll also find stairs leading to the top of the aqueduct for an up-close look at its construction (20,000 blocks, no mortar!) and a pretty surreal view. 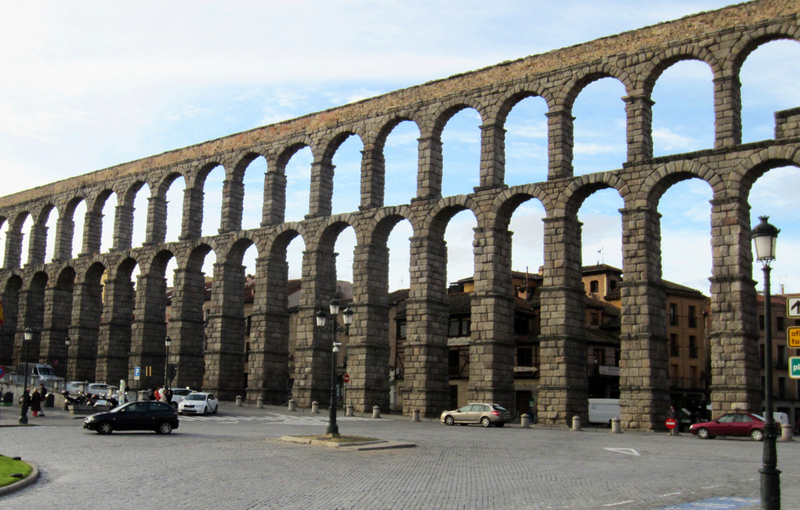 Impressive to say the least, it’s easy to see why the town of Segovia and its aqueduct have been classified as a UNESCO World Heritage Site. Even though the map below shows a direct route, we took our time wandering from the aqueduct through the maze of quiet streets lined with warm sandstone-patterned buildings in the Jewish Quarter before arriving at Plaza Mayor. The square has been at the center of Segovian life for centuries, hosting “entertainment” ranging from executions to religious performances and even bullfights. In addition, Isabella I processed thorough here on her way to the Iglesia de San Martín church where she was crowned queen of Castile and León in 1474 (look for the 12th century Romanesque church with a covered portico on Calle Juan Bravo). 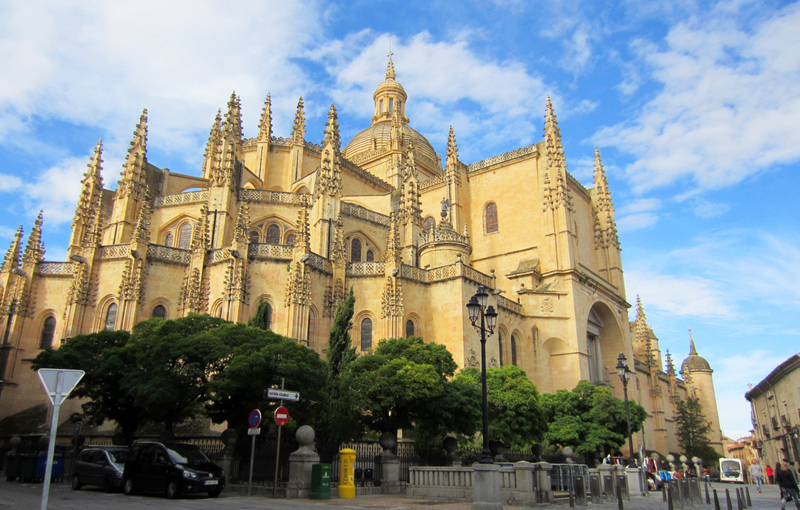 The anchor of the plaza is the beautiful Segovia Cathedral, built between 1525 and 1768. Since construction spanned more than 200 years, much of its architecture is decidedly Gothic – think pinnacles, flying buttresses and gargoyles – but instead of a spire, its topped with a dome thanks to the arrival of Renaissance before its completion (the Segovia Cathedral is considered the last major Gothic building in Spain). Compared to its elaborate exterior, the cathedral’s interior is slightly more austere but equally as interesting with 3 naves, more than 20 side chapels that once belonged to the city’s wealthy families and wooden choir stalls from the previous church that stood here (the cathedral is the third church to be built on this spot). You can also climb the cathedral’s bell tower, which soars nearly 300 feet into the sky. By now you may be ready to stop for lunch, and lucky there are many restaurants nearby clustered around Plaza Mayor. We had brought some snacks and fruit to hold us over, so we were tempted by another treat – the city’s famous ponche segoviano cake. This rich lemon-infused sponge cake is layered with custard filling and then wrapped in marzipan and decorated with a lattice-like design of icing sugar with the help of a hot iron. 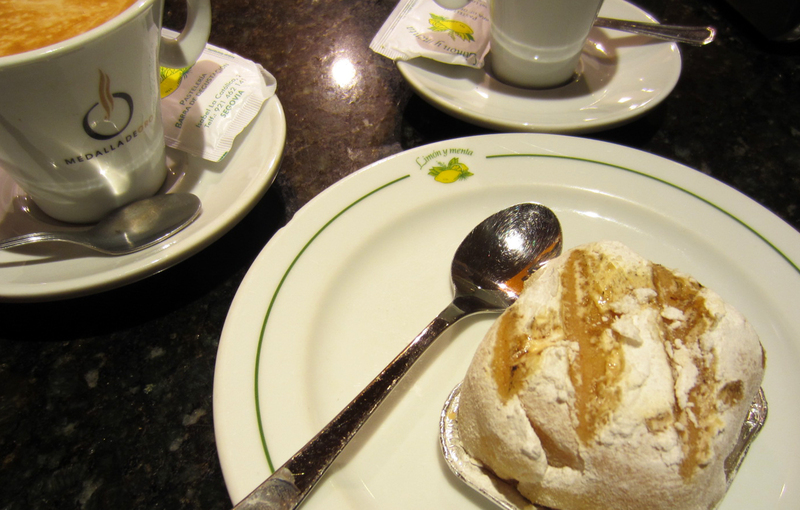 The best place to indulge in this local specialty is at Limón y Menta just southwest of the plaza on Calle Isabel la Católica. We grabbed a seat at the bar and ordered a piece to share along with coffee. It was heavenly (or should I say sinful?) and proved to be the perfect pick-me up before heading out to our next destination. At the northernmost part of the city high above the valley below, the Alcázar is the stuff fairytales are made of – towers, turrets, slate spires and a moat (albeit empty) – all that was missing was maybe a dragon or knight in shining armor (the latter which we found inside the palace’s armory). In fact, it’s believed that this picturesque palace was one of the inspirations for Walt Disney’s Cinderella Castle. Built upon the site of a former Roman fort, the Alcázar became a favorite royal residence for the Castile monarchs during the Middle Ages. After the crown relocated to Madrid, it later served as a prison for 200 years and eventually became the home of the Royal Artillery School in 1762. 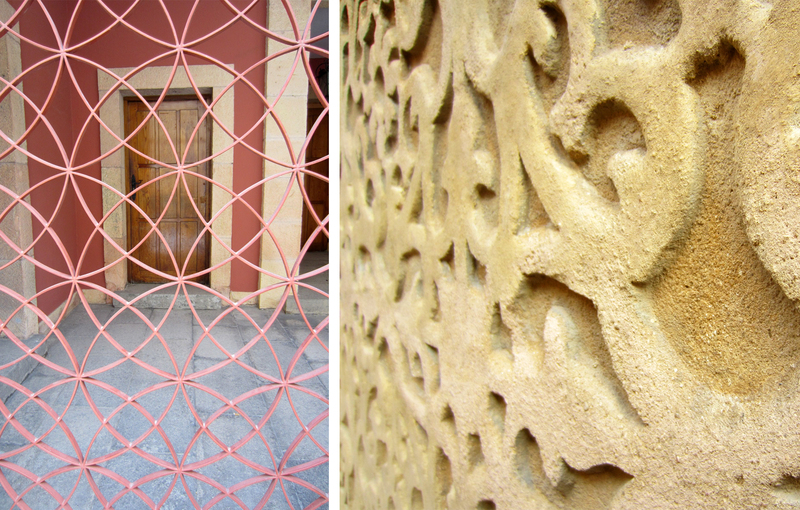 Even though what stands today is an exaggerated reconstruction (much of the Alcázar was destroyed in a fire in 1862 but was quickly rebuilt), we thoroughly enjoyed exploring the castle. It’s a one-way route through 11 richly decorated rooms, my favorites being the Throne Room and the Pinecone Room with its ornate ceiling. 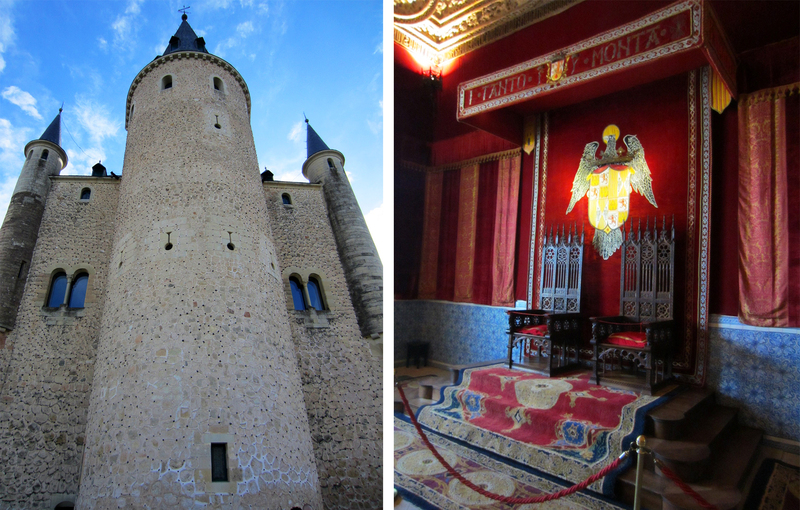 You’ll also have access to the museum-like armory and can make the 152-step climb up the tower for an amazing 360-degree view (would you expect anything less from a fortified castle?). During our mid-October visit, the Alcázar was set against a backdrop of golden hills that danced with multi-colored leaves, green changing to yellow and orange, and the Segovia Cathedral in the distance. It was easy to spend at least an hour or so at the castle, and afterwards we made our way back to Plaza del Agoguejo at the foot of town, stopping to browse a few shops along the way. We picked up bus #11 in the same spot where we were dropped off in the morning and had just enough time for a beverage at the train station before heading back to Madrid. That aqueduct is very impressive. At the risk of offending some vegetarians, I have to say that we ate the most amazing roasted suckling pig in Segovia. Apparently something they are know for there. The chef comes table side and cuts the meat with the edge of a dinner plate. Awesomely delicious. Wow, that does sound awesome!!! Nice! 6 hours very well spent! Thanks, we had so much fun!